I went to see Regan Tamanui’s (aka HaHa) ‘Residency’ at the House of Bricks in Collingwood. HaHa is amongst the best stencil artists in the world and House of Bricks is one of the funky converted warehouse gallery spaces focused on the street art scene. Why a ‘residency’ was my first question? He explained that was offered the space due to a cancelled exhibition. 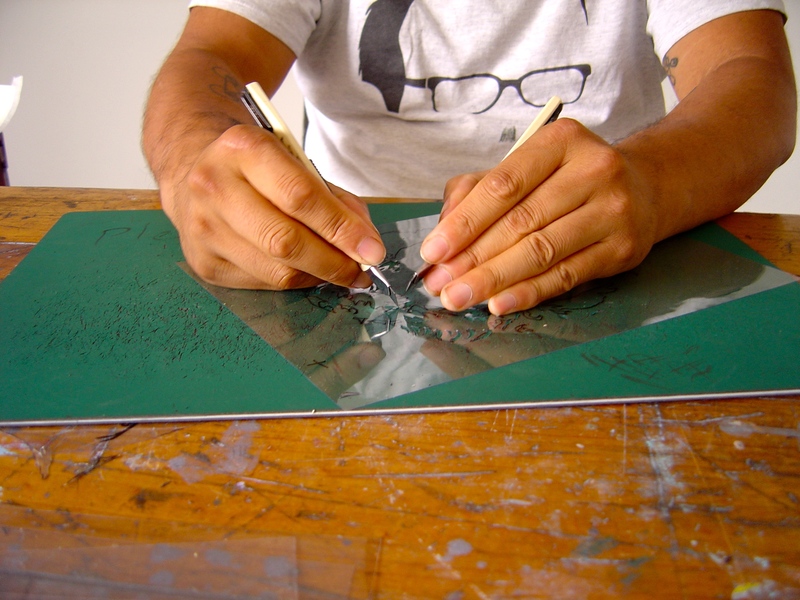 HaHa cutting stencils with both hands. It is an informal way of working in public. Set up a studio, just a couple of tables and chairs, at the House of Bricks. With the roller doors of the House of Bricks open, Regan is practically working in the street and in public. On the white wall he was taping up his work for sale at the very affordable price of $60 a piece, so I bought one. He is also offering to do stencil portraits for $100. Regan is happy to explain and demonstrate his multi-stencil technique or just chat with the people who come in. He said that he has been attracting a fair number of local identities and eccentrics. He told me the best advice was not make eye contact with them otherwise they would talk forever. 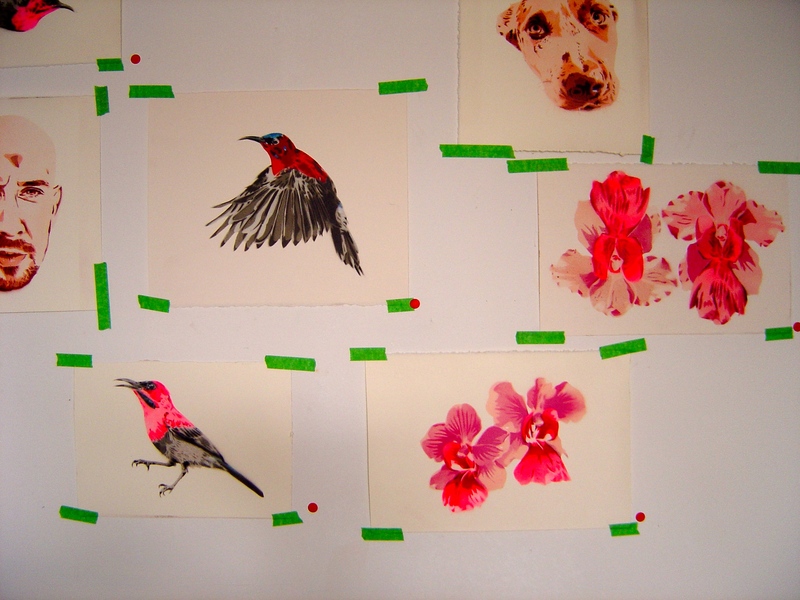 There were small stencil studies for future work inspired by recent trips to Singapore, the Northern Territories and Papua New Guinea: orchids, crimson sunbirds, kookaburras, the Devil’s Marbles in the Northern Territories, along with portraits of dogs and people. After that I wandered around the area. 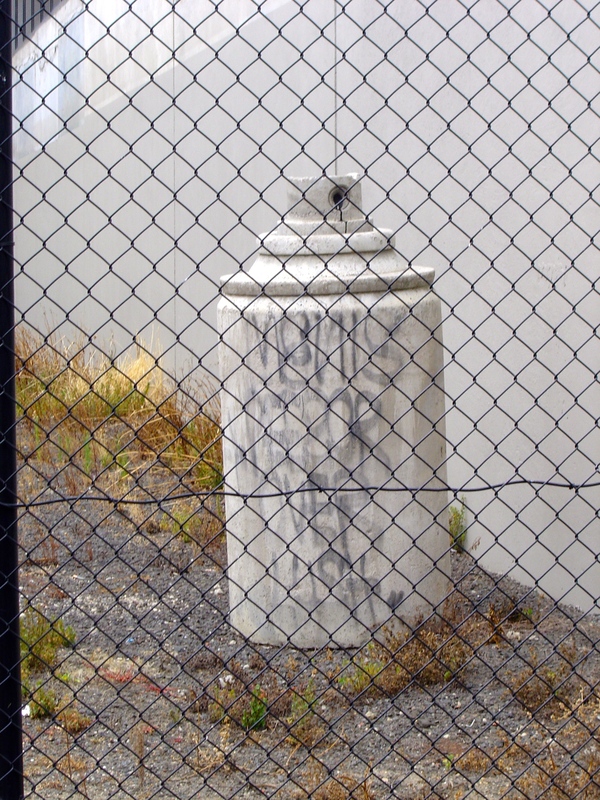 Regan told me about a large concrete cast spray can in an empty lot behind a chainlink fence a block away. I’m sure that is by Dface when he visited Melbourne in 2011. At the back of the lot against a concrete wall there was also a fake tomb stone, presumably also by Dface, that reads ‘Cheat Death’ (too far away for the zoom on my little camera). On my walk I saw Tom Civil’s wooden cut out versions of his figures decorating the wall of the community garden on the corner of Cecil and Gore streets. 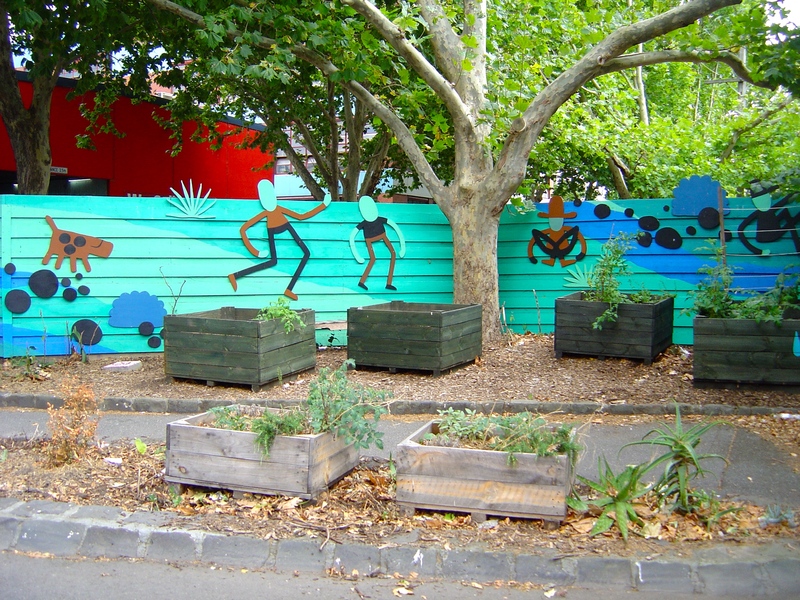 It is not a big garden just a few planter boxes and benches but it makes a big impact on the street. In Easey Street there were these decorated power poles, I didn’t think much of them, they looked a bit ugly, not surprising given the Christmas theme of some of them. 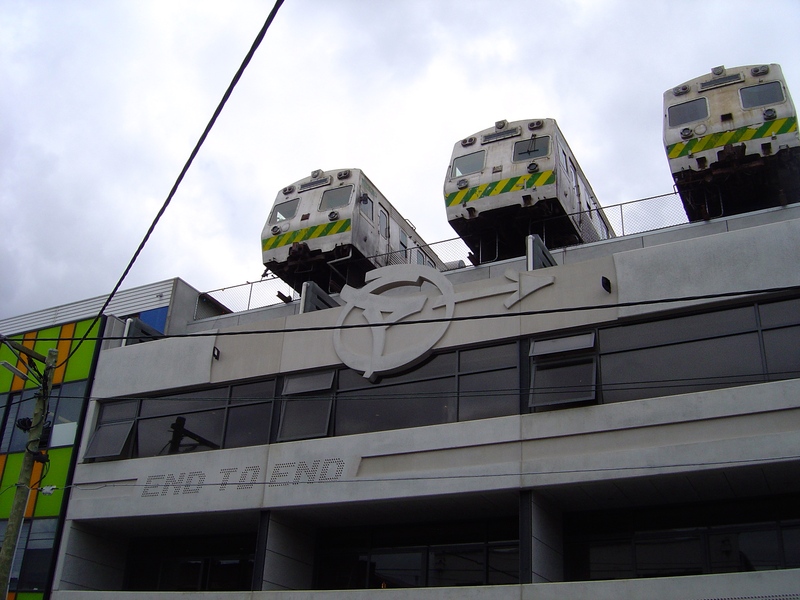 This entry was posted on Tuesday, January 27th, 2015 at 9:32 PM	and tagged with Collingwood, community garden, Dface, Easey Street, Fitzroy, HaHa, House of Bricks, Regan Tamanui, stencil art, Tom Civil and posted in Architecture, Street Art. You can follow any responses to this entry through the RSS 2.0 feed. Beautiful stencils, they look like they are glowing! Yes, he has a wonderful soft spray technique. 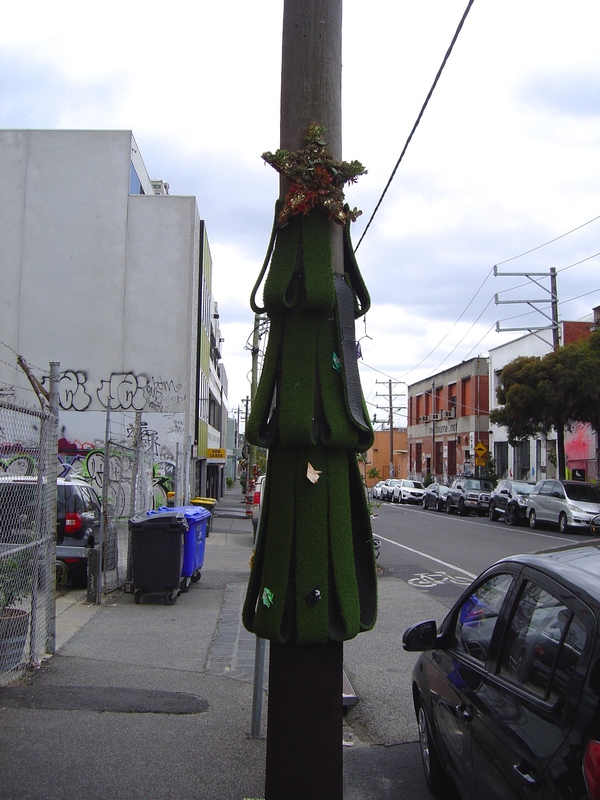 The photo representing Xmas decorations in Easey St were not constructed or designed by WEBB+. I don’t know how I got the idea that it was designed by WEBB+ but it was a result of doing research that was clearly incorrect as I don’t just randomly assign attributions. I have edited the post. Cheers Simon, I notice that you have just subscribed.